Houston’s proximity to the gulf makes it all too plausible that your business could suffer from water damage during hurricane season. Water damage can be costly both in repairs, and in shutting down your business during repair time. KIWI wants to help alleviate both of these costs through our budget-friendly quick and efficient Houston commercial water damage restoration services. 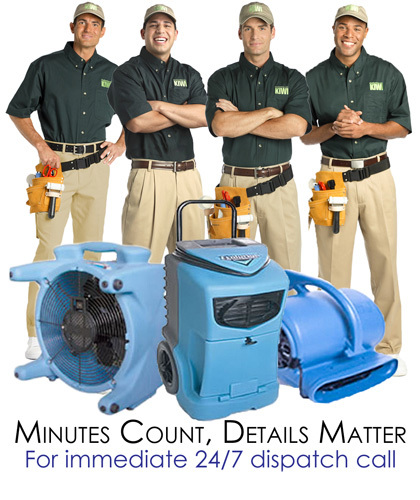 KIWI knows that water damage can strike at any time, which is why our services are 24/7. Whenever there is an emergency, KIWI is there to help. Don’t hesitate in calling KIWI’s emergency hotline as soon as problems arise in your business. We can also work afterhours to avoid interfering with business operations. If you’re unsure if KIWI can work on your type of business, don’t worry, we can. We offer our services to all types of businesses ranging from offices to retail shops. We know that water damage can strike any business, which is why we are equipped to work on all buildings. KIWI is more than happy to work with your insurance provider on the costs of repairs. We want to make sure you are provided with the best service that can be cost efficient to you and your business. We provide a one-year clean guarantee for all of our water damage restoration services as well as a one-year carpet cleaning warranty. Call KIWI right away if your Houston business has been struck by water damage. We will move quickly to get your business back in working order.